Do you have a website, but not enough traffic? Have you thought of starting an email list? Yes? That’s awesome. And now you’re wondering how to get those emails, right? That’s where email sign-up or pop-up forms come in. These are the pop-ups you see on many websites you visit online, that ask for your email address. Usually, they’re offering you some sort of incentive. Sort of like a trade-off. You get something of value and they get your email. There are many options as to where to place these. But where is the best place? Well, that’s why I’m here today. To show you the best, high converting places you can put your sign up form for a high email capture rate. Before we get to the high converting placement of your opt-in forms, let’s look at a few things to create and enticing form that will attract your readers to take action. Less Is More – Get rid of as many fields as you can. The simpler the better. Really, you only need to ask for the email address, but asking for their name is ok too. It’s needed if you want a double opt-in. Sell It – Always offer an incentive to obtain their emails. People aren’t willing to give away any personal information unless they’re getting something of value in the exchange. Social Proof – Show your visitor who else is on the list. Mentioning well-known names is a great way to get others to sign on. Next Step – Tell your visitors what’s going to happen when they click that button. Everyone likes to know what to expect next. Design Matters – People trust beautiful designs more than plain ones. It shows professionalism and a desire to keep your site attractive. Single Column – According to eye-tracking studies, single columns work better. Submit Button – Your call to action is the most important part of your form. So make it big and obvious. Make the button as wide or wider than the field for the email address. No Captchas – Unless you have serious security issues, don’t use captchas. You’ll tend to lose more opt-ins than gain them. People get frustrated when they fail them and just leave. If you need added assurances, use a double opt-in. This spot is at the top of your sidebar. This is probably the most common place for one. Because most people are used to seeing one there, they automatically look for it. You could be losing out on valuable email subscribers if you don’t. You can even add several there. One for a newsletter for example. And another for a promotion. Maybe an offer for your new ebook. Give your viewer some choices. This way you can start segmenting your list right away. You will know their interests according to which sign-up form they use. Look at Anik Singal’s Lurn Nation blog. He has a sign up for his “digital bootcamp”, and another below for promoting his gear. They don’t all have to say “subscribe”, or “sign up”. Notice the second sidebar form in the above picture. Saying things like “learn more” or “click here” all do the same thing. It will bring your reader to a second form that asks for their email address to acquire whatever it is you are offering. Many marketers are questioning the use of sidebars, and think its past its time. Professionals are moving towards a cleaner design that doesn’t distract from the blog itself. If placed at the top right (above the fold), you can still get more subscribers. If you include a short bio and headshot, you’ll create a more personal connection. It keeps your most important information in front of your visitor. Personally, I prefer a very clean design to my blogs, in hopes of keeping my audience there longer. I believe it really depends on the niche you’re in, and what suits your website. I do recommend you keep your sidebar at a minimum, though. There’s nothing more distracting than a busy page with information overload. This is a great place to put an email sign-up form because its the first thing your visitor will see. If your sign-up form is a vital part of your business, then this is the best place to put it. You don’t want to hide it somewhere else. You want it to be a prominent feature of your website. Take a look at Vimeo’s website feature box. It’s the first thing you see when you land there. If you click on “Join Free”, an email subscribe box pops up. If you’re not interested, just keep scrolling down the page to see their information. You should check out Vimeo if you have a chance. I’m not sure how often they change up their header design, but this one is an animated header, with the flashlight moving back and forth. As you can see, it takes up the entire area above the fold. Even though this is a big area, it should still be clean and simple. Make your call to action easy to act upon. A confused reader is a lost opportunity. This is a cool little WordPress plugin. It’s a full-width bar at the top of your site, that spans the browser window with some text and any link. It’s been proven to be very effective at lead generation. They say that using this unassuming little bar generated more than 1000 leads, in 30 days, for them. Onwebbox.com uses the hello bar over their feature box for double the effectiveness. Their hello bar offers a 50% discount, with the link in the “click here” box. This little plugin can do a lot. It can be synced with quite a few autoresponders for email marketing. It can be set to show on only specific pages. You can set certain dates if you’re promoting an event or sale. You can even target certain visitors coming from specific URL’s. For example, you can have the option “Pinterest”, and only visitors linking to your website from Pinterest will see the hello bar. I’m sure you’ve all heard the phrase “Nothing makes me leave a website faster.” Maybe you’ve said it yourself. Those annoying pop-ups! Yet, statistically, they’re still the most effective way to increase your email subscription and conversion rate. Websites with pop-ups consistently outperform those without. Have you heard of Optinmonster? They are a reputable autoresponder, specializing in email capture tools. Their site provides case studies of various companies who have used their services. A study of Germany’s largest bargain platform, showed a conversion increase of 2100% using pop-ups. This German company decided to use their Exit-Intent pop-up. It uses a special technology that detects the mouse behaviour of the user. When the mouse pointer moves towards the exit button location, it prompts the message to pop-up. I personally love this one. It still grabs the reader’s attention, but it not “in their face” as soon as they land on your site. Most autoresponders will have a timing feature for these larger pop-ups in case you prefer to have it appear, let’s say, 30 seconds after they open your page. This way, your visitor can get a chance to look around and enjoy your content before you ask them to subscribe. Another nice feature is the shading of the background, just enough to let the pop-up form stand out, but still able to see what’s on the site behind. Having your pop-up timed perfectly to suit your readers may take some testing. Once you’ve figured out the most effective trigger time, this type of display is very eye-catching. It’s a great way to catch abandoning visitors. This is probably the newest form of email capture used today. And it’s been proven to be very effective. Brian, from Backlinko, says that two links increased his conversions by 785% in one day. Wow! This is a way of offering your visitors an incentive that’s directly related to the post content they were reading about. Simply find a high traffic page on your site and create a resource relevant to the post. Add the link somewhere in your post which will open up an email capture form. Voila! I have a short video for you to watch from one of my favourite marketing “gurus”. He talks about his two strategies to grow his email list. Enjoy! He uses the Hello Bar and an exit strategy pop-up. He uses content upgrades to bring people to his email sign-up page. If Neil Patel likes and uses the Hello Bar plugin, then it’s most likely the best popup tool out there, lol. Did you know that your “About Me” page is probably the most viewed on your website? So why not try to capture emails here? 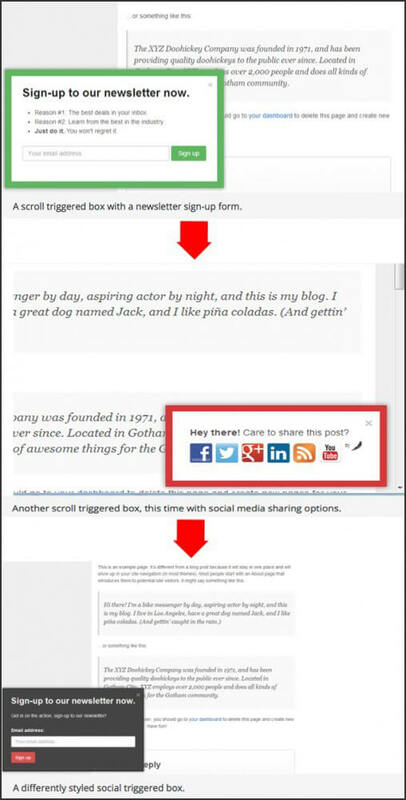 On Goinswriter.com, Jeff uses an email subscription box at the bottom of his bio. It’s simple and flows naturally with the text. Visitors will feel like its the next natural step to take…to fill in their email address. If your visitor has made it to the bottom of your page, you can be sure they enjoyed reading your content. What a perfect time to ask them to sign up to your email list. This is the one place that many sites lose their interested visitors. You’ve maintained their interest until the end, so why not ask now? Chances are they’ll be keen to sign up. On Sarah’s xosarah.com, she puts her sign-up box in the footer of her entire website. So whether you visit her blog, or her about me page, etc., you will see it at the bottom of everything! If you’d rather not have a sign-up form on every page, why not trigger the pop-up when your visitor finishes your post. It’s along the same line of thought as the footer box, only its a pop-up rather than embedded on your website. This is similar to the exit-intent pop-up, only its triggered when your visitor has scrolled all the way to the end, rather than when the mouse pointer heads towards the exit point. This is another way to highlight you sign up form. If you want your audience to opt-in to your email list, why not make this the first thing they see. Because this is the portal to your business, it can also give your visitor an overview of what your business offers. If you’re a jack of all trades and offer different specialties, you can direct your reader to the right product or service. This is another fantastic way to link multiple websites to one domain name. With a splash page, you’ll want to move your navigation buttons to the bottom of your page, rather than the top. Then you can devote your entire page to focus on the email sign-up form. Your viewers can then move to other areas of your site using the navigation links below. Tim Ferris, of fourhourworkweek.com, makes it clear that you should start with signing up to his email list before moving onto other sections of his website. Shane Melaugh, co-founder of Thrive Themes uses his splash page a little differently. He asks you to check out the case study, which opens to an opt-in form. If you want your email opt-in to be in view at all times, then this is for you. It literally floats, either at the top or the bottom of your page as your reader scrolls. It “sticks” to the same spot no matter where your visitor goes. Depending on the colour theme of your website, you should consider having your bar a contrasting colour so it stands out. This type of email opt-in form may not suit every type of niche. If you have an online store, this is a great way to display a promotion or seasonal sale. And for all those procrastinators out there, a countdown timer works well to nudge a decision. Just make sure your call to action button is clearly understood. As you can see with this website below, the bar is at the top of the page when you enter. As you continue to scroll down, it remains or sticks to the top of the page, so the opt-in request is always in view. This is a less-intrusive form of a pop-up. They typically appear in the bottom right-hand corner of your page, when your reader starts to scroll down the page. This way, your opt-in box is highly visible but doesn’t obstruct your reader’s view of the content. What’s really nice is the ability to trigger its appearance at different times and with different messages. For example, when your reader starts scrolling down, you can have a pop-up asking them to sign up for your newsletter. A little later on, you can have one appearing to share with social media buttons. And near the bottom of your post, have one appear offering an incentive for their email address. In the picture above, they have the scroll box sliding in from the side. Sometimes on the right, sometimes on the left. Personally, I always prefer the right. Statistics show that they’re more effective there and give up a higher opt-up conversion rate. But it’s your choice, really! I hope this article has given you some ideas for your own email capture boxes. Ideally, you want the highest conversion spot for your business. You may have to do some testing to see which location works the best. Thankfully, it’s an easy fix. There are many autoresponders available, and even just free plugins if that’s all you desire. I personally love Thrive Themes, and this is what I use as an autoresponder. They have a sophisticated email capture software and so much more. I think they have the best sign up forms out there! But that’s my opinion, lol. Once you start building your list, you want to consider nurturing your leads to become loyal followers. That’s where the entire email marketing campaign comes in. Please don’t let this scare you. It’s really quite simple. To help you, I’ve written a beginner’s guide to email marketing to help you out. It breaks down a whole campaign to give you the overview. So, do you have an online business needing more traffic? Or maybe this is still a dream you’re wanting to start. If that’s the case, I’d like to recommend the best platform online to learn how to start a business and build a passive income. Just click on the picture below. You can start for free. You won’t regret it! What email pop-ups do you use? Have you changed it up lately, to keep things fresh? If you have any questions or comments, please leave them below. Great article, Suzanne. All great usable points. I love Neil Patel and Brian from Backlinko. Two gurus that walk the talk and get results. I will certainly be changing a few things in my style. That’s great Michelle, I’m glad I could help. Yes, Neil and Brian are fantastic marketers, aren’t they. And the methods they use work so well. We can all learn so much by watching what they do. Best of luck with your changes. I’m sure you’ll love the results. Great article, Suzanne. It gave me a lot of perspective on what’s being done in the market. Your array of choices covered the landscape very well – a very helpful addition to our traffic building ventures. Every bit helps, as with your other articles that are so well written. Keep up the good work, and have much success. I’m glad I could be of help. We all need a little help seeing what’s most popular and effective, don’t we? I hope you can apply some ideas to your own site. I believe if we change things up everyone once and a while, it can attract even more traffic. Wow, this is all such great information! I do have an email sign up form, but I have never really done anything with it yet. I guess I am working on figuring out what I can send out to those that do sign up. I keep putting it on the back burner, but I really do need to get with it. This gives me some great ideas for stepping it up and doing the sign-up form right! Hi and thanks so much for commenting. I’m happy I could help you out! You’ve got the first step done, capturing the emails. And if you’re able to do that without an incentive, that’s pretty good. But it’s amazing how many more you’ll get with some sort of give-away. If you can’t decide what to offer, go check out your competition. You’ll get some great ideas that way! There are a few ways that I definitely looked at to implement on my site. I really don’t like pop up at all. But seeing how many people are getting a lot more email sign-ups by that alone, is enough for me to reconsider it. Thanks Zach, I’m glad I gave you some ideas. I know how you feel about pop-ups. I feel the same way, but when you look at the statistics, it’s still a great idea.